Happy Spring everyone! If you are looking for ideas on how to add spring to your home, I would love to show you how I decorate my home for the season! During this time of year, everything is blooming and the stores are filled with all kinds of beautiful flowers. Every year, I love adding colorful bouquets around the house. Most of the time, I purchase my flowers at the grocery store. First, I start with a large bouquet and I put them in a pretty vase. As time goes on, I pull out the ones that are dying off, cut down the rest and place them in a smaller vase. I keep doing this until the vases get smaller and smaller. This way I get the most out of one bouquet. Adding flowers also gives me an excuse to create some new vignettes. Usually, I find it easiest to start with a tray like the one above and then just fill it with some pretty seasonal items. 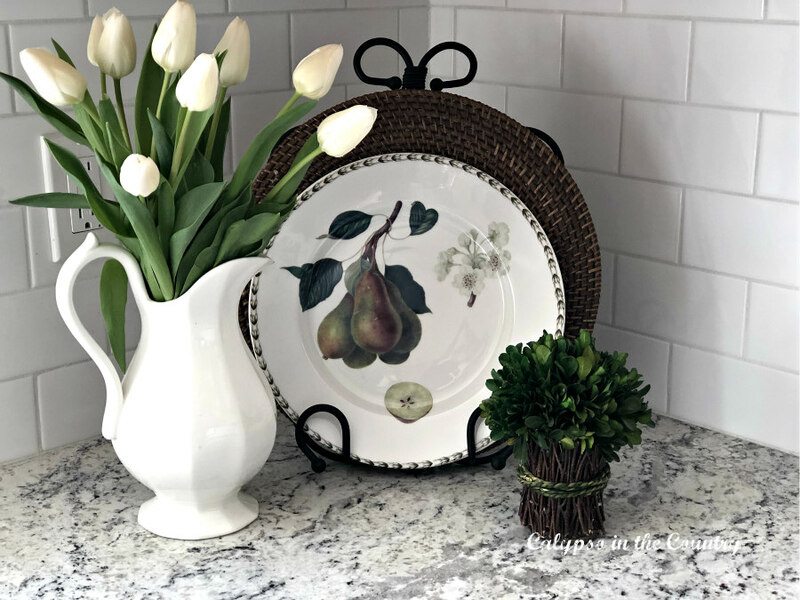 My kitchen feels more inviting with some spring decor on the middle of the kitchen island. Since I was decorating for St. Patrick’s Day, I thought a shamrock plant would be perfect to add to my bar cart. Then I noticed it was drooping so I moved it to the kitchen window as you saw above. Well, from what I have learned, the oxalis plant (aka shamrock) actually droops at night and perks up during the day. Who knew? Not me of course, but I have realized it is thriving now that I moved it to the kitchen window. It definitely prefers a sunnier location. Each season, I love changing the vignette in my kitchen corner. Simply by changing the dish to something springy and adding some flowers and greenery gives the spot a fresh new look. I frequently mix live flowers with faux greenery. Like I said, I don’t have a green thumb so I don’t need the pressure of keeping too many things alive at once! It’s hard enough just keeping tulips looking fresh. Apparently, adding a penny to the water to make them last longer. I think it helps but other types of flowers definitely last longer than tulips. That’s why mixing in faux plants makes life so much easier. Although I don’t have too many Easter-specific decorations, a simple bunny above the stove will take us from spring right into Easter! In the case above, it was actually a counter-setting but I have done other table settings for spring too. Changing throw pillows are a quick and easy way to update the family room for spring. Since many of my pillows have zip off covers, I don’t have to worry about storing a huge pile of pillows either! When you add spring to your home, don’t forget the front door! In the past, I have used simple forsythia wreaths, baskets and this tin hanger filled with faux tulips. Either way, it’s nice to have a spring welcome to our home. Open the Windows and Feel the Breeze! In my opinion, there is nothing that says “welcome spring” more than a fresh breeze through the open windows. What have you done to add spring to your home? Love all those gorgeous flowers. I am especially fond of tulips and yours are beautiful. Those pretty pillows speak to me too. Thanks, Marty! I always buy tons of tulips in the spring, even though they don’t last very long. We are finally getting some sunny weather here so I am excited for the change of seasons! I need to treat myself to some fresh flowers for my home. I enjoy them so much when I do but hardly ever think about it when I’m in the store. I never spend a lot on mine since I usually just buy them in the grocery store. They have some great selections these days! Loving those pretty blooms! Feeling inspired to go pick up a bouquet (or two) and then throw open the windows and get some nice fresh air… thanks for the sweet reminder that spring is just around the corner! Thanks! Yes, so exciting that spring is almost here! Thanks, Jeanie! I am shocked my shamrock is still alive! And I want to thank you so much for linking up to our Celebrate Your Story link party. We hope we are providing a celebration of your post and perhaps yours will be chosen as a feature by one of the hosts. Thank you, Kari and Happy Spring to you! some really great tips here. I love changing my sofa cushions for lighter colours. Thanks, Natasha! Yes, the pillow covers are an easy change that can make a big difference. Thanks for stopping by! Thanks so much, Tiffany! I don’t have too many Easter decorations but I like to bring out my favorite bunny to add to my spring decor. I am SO ready for spring but I wish our weather would just cooperate… Enjoy your weekend! Thanks so much! It’s become a favorite place to decorate in my home! I hope you find some pretty flowers…hooray spring is here! Beautiful spring touches. I love, love your kitchen!!! Thanks so much, Cindy! You are so sweet! Happy spring Shelley, your home looks lovely with the touches that you have added. Thanks, Karen! Happy Spring to you too! Your kitchen stove is to die for! Love the flowers on the door. I never would have thought of that! Aww, thanks so much, Hilda! Have a wonderful week! Thanks so much, Marilyn! Enjoy your weekend! Everything looks gorgeous and you know I love an open window in the spring.Tulips say Spring to me too. I know they dont last long and it can be hard to cut them from the garden. But, I love how after a day or two they droop over a bit. HUGs! Thank you so much, dear! Yes, tulips really say spring to me too. Thanks for stopping by with your sweet comment! Great ideas for adding spring to your home! Thanks for sharing with us at the Welcome Spring party. Pinned. 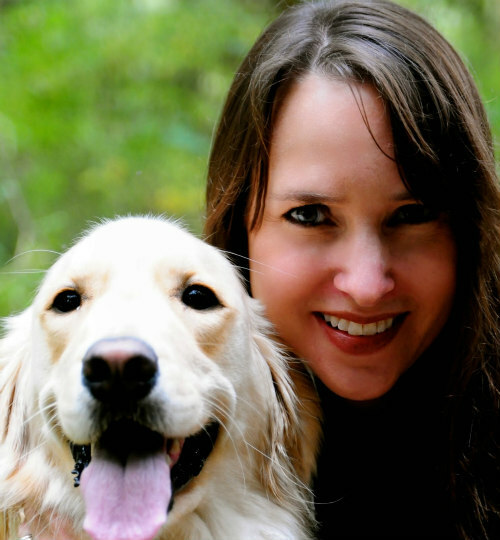 Thanks so much – and thanks for pinning! Hooray for spring weather! Thank you – spring is my favorite season! Thanks so much for the feature…I am honored! Love all your spring decorating. I had no idea there was such a thing as a shamrock plant? I love that! And the pictures with the breezes coming in through the window? SO PRETTY! Thank you so much, KariAnne! Yes, isn’t that shamrock plant adorable? Shocking, that I have managed to keep it alive! Enjoy the rest of your week, my dear!